This Provençal dish is traditionally cooked in a pot sealed with dough to keep the chicken moist. You can dispense with the dough if you have a casserole dish with a very tight-fitting lid. The garlic ends up as soft as butter with a gentle, mellow flavour. Squeeze the cloves out of their skin and eat with the chicken. Heat 2 tbsp of the olive oil in a large frying pan over a medium heat. Fry the chicken pieces on all sides until golden brown. 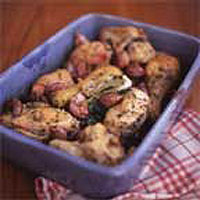 Put the chicken and garlic cloves in an ovenproof casserole dish, with a lid. Pour over the remaining oil and mix well to ensure the chicken and garlic are well coated. Season with salt, pepper and herbes de Provence. Plant the bouquet garni in the middle. If you want to seal the dish, make a dough with the flour and lard and a little bit of water. Roll into a long sausage. Moisten the inside rim of the casserole, press the dough sausage all the way round and clamp the lid firmly in place. Cook for 1½ hours. Break the seal at the table and serve.